Nawapol Thamrongrattanarit's offbeat indie stylishness remains intact in his big-studio directorial debut Freelance, a comedy the GTH studio has marketed as a bright romance involving a man afflicted with a rash and his female doctor. But it’s not really “Doctor, doctor, give me the news” – it’s more a sprawling, dark satire on the creative life becoming enslaved to deadline pressures. Sure, the pulse quickens as the young female physician played by Davika Hoorne asks leading man Sunny Suwanamethanon to raise his shirt. But the sweet, tentative friendship that develops between them is only a small part of a long movie that in Thai is known by the longer title Freelance ... Ham Puay Ham Phak Ham Rak More (ฟรีแลนซ์.. ห้ามป่วย ห้ามพัก ห้ามรักหมอ). 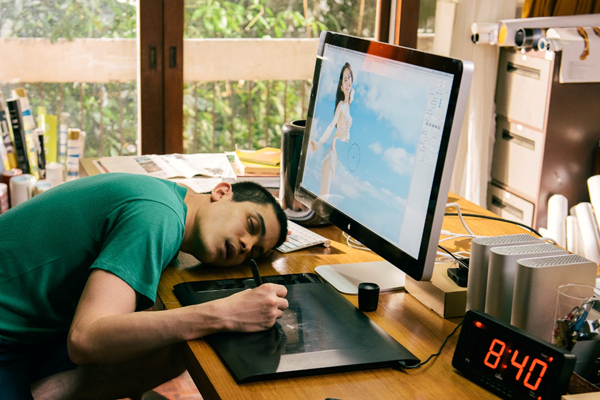 It’s really about the ups and downs in the career of a freelance graphic designer. Sunny is Yoon, a worker bee who spends his days and sleepless nights in his apartment, staring at a computer screen, retouching photos for magazine spreads and advertisements. So it’s cleverly ironic when the graphics guy who erases nip slips on fashion models comes down with a pesky skin rash. He at first goes to a private hospital and comes away with the requisite sack of overpriced pills that “may cause drowsiness”. These are of course less than helpful in Yoon’s all-work-no-sleep world, and are quickly chucked in the bin. The rash persists and spreads and Yoon’s friends start to show concern, so he eventually ends up at one of those dreaded public hospitals. Here’s where Nawapol’s knack for observational humor really kicks in, as Yoon, turning up at the way-too-late hour of 6am, finds himself at the back of a vast intake queue that stretches through corridors and up a flight of stairs. It’s a guaranteed laugh for the audience because we’ve all been there and done that. And there are a lot of scenes like that, based on the real-life experiences of writer-director Nawapol and his indie-filmmaking pals. Another example has Yoon turning up at the funeral of a friend’s father. His deadline is looming, so he asks a monk for the temple’s Wi-Fi password and plugs in his laptop right by the casket. It sounds shocking, but some insensitive lunkhead somewhere has probably actually done that. And in the context of the movie, it’s hilarious. After waiting an eternity in the hospital queue, Yoon finally meets his doctor. She’s Imm, a young resident who’s still studying her medical books. There’s a spark there, an unspoken recognition between the two that their lives are very similar. Although Imm already knows what Yoon is thinking, she can’t determine what’s causing his rash. She can only tell him things everyone knows – exercise, eat right and get plenty of rest. And, oh, don’t scratch. Yoon makes small changes in his life, such as joining a gym, hitting the hay at a reasonable hour and laying off his beloved 7-Eleven shrimp puffs. But as soon as Yoon’s rash disappears, so do any feelings he might have had for the doctor. “It’s all good, doc,” he coldly tells her on a visit, opting to formally wai her instead of shake her outstretched hand. She’s visibly hurt. And soon Yoon is back to pulling all-nighters and subsisting on cocktails of Red Bull, soda and coffee. The cast, as always with GTH films, is top-notch. Sunny, a reliable leading man in the studio’s comedy Dear Dakanda (in which he fell in love with a nurse) and last year’s I Fine Thank You Love You, fits the mold as Nawapol’s surrogate, no doubt with much help from the director, who loaned the actor some of his cool T-shirts to get into the role. Davika takes a welcome turn in a contemporary setting, a more relatable shift from the period characters she’s played, like the ghost in Pee Mak and the tragic heroine of Plae Kao. In Freelance, she’s an achingly lonely figure, a medical student whose insecurity is of little help in the face of her inexperience. This is a view of hospitals and doctors more in line with the TV comedy Scrubs than how they are usually portrayed in Thailand, where the medical profession is held in high reverence. There are many strong supporting characters, but the most valuable player is Violette Wautier as Yoon’s agent and level-headed best friend Je. She goes from enabling Yoon’s self-destructive work ethic to helping him get back on his feet. Nawapol cast many other filmmakers in fun cameos in his indie feature Mary Is Happy, Mary Is Happy. Here, he has a couple of GTH talents. One is Pee Mak director Banjong Pisanthanakun, who steals the scene as a doctor substituting for Imm during one of Yoon’s visits. Another is Bangkok Traffic Love Story helmer Adisorn Trisirikasem, who appears in goofy photos as the soldier boyfriend of Je, and adds to his cult status as a quirky character actor, as also seen GTH’s Hormones TV series. My only knock on Freelance is that, at two hours and 10 minutes, it probably runs too long. Nawapol knows this, but with a densely packed story that has so much to say, it’s hard to see where he and his editor Chonlasit Upanigkit could’ve made cuts. And Freelance is remarkable in that it sustains its level of interest and energy throughout. With most other commercial Thai films, the excitement tends to peter out after the first 30 minutes. Freelance, also marketed internationally with Nawapol’s original and now-unnecessary title Heart Attack, represents a further blending of hip, indie-film street smarts with the corporate slickness for which GTH is known. While involvement with a big studio perhaps diminishes Nawapol’s hipster cred, GTH’s much-vaunted “feel-good” formula is subverted, and Thai film culture is much richer for that. I like it a lot and think the title "Freelance" fits better than "Heart Attack." I think you missed something when you claim that she didn't really change him as he went back to being a workaholic after he heals...because there is a reason he went back to work (to get over his broken heart--that whole scene with the 7-11 friend Kai). And I think he acted strangely on his last day with her because he was too shy to ask her out on a date. :-) But a lovely film--the internal monologues are very funny.